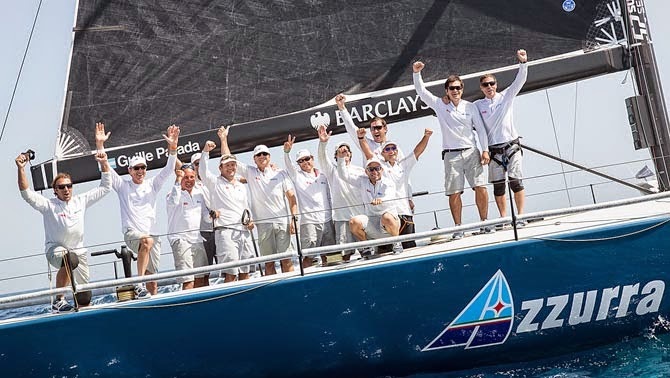 With a first and second today, the Yacht Club Costa Smeralda's yacht has won the Rolex Capri Sailing Week and taken command of the Barclays 52 Super Series. The wind came back for the final day of the Rolex Capri Sailing Week, allowing two races to be run and confirming Azzurra's clear supremacy over her tough competitors. Before todays racing Azzurra was tied for first with Vesper, the American boat that finished second, four points behind Azzurra. Quantum Racing, direct opponent of Azzurra, finished in third, six points behind. Azzurra closed the first regatta in second position, after rounding the first windward mark in third behind Ran and Vesper. She then passed Vesper during the first run using different reaching tactics. For the second race, Vasco Vascotto, Azzurra's tactician, wasn't surprised by a sudden right shift shortly after the start. The best boats came into the windward mark right on each others heels, and Azzurra was the first around. From then on the YCCS yacht extended her lead to win, followed by the newcomer Phoenix, then Quantum and Vesper. The race committee tried to get a third race off before the time limit, but an unstable breeze didn't collaborate. With her win in the last race, Azzurra took home the Barclays 52 Super Series first event. The second event will take place from the 10th to the 14th of June at Porto Cervo, organised by the Yacht Club Costa Smeralda, as the Audi TP52 World Championship. The Rolex Capri Sailing Week was organised by the International Maxi Yacht Association together with the Yacht Club Capri.